Similar to hot apple pie, this apple enchilada is sure to be a hit. It is a delicious way to end any of your Mexican style meals. 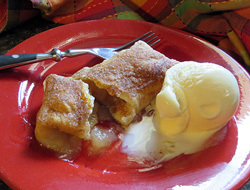 Put apple pie filling in tortilla and roll like an enchilada. Note: It is easier if you heat the tortilla for about 10 seconds in the microwave before rolling. Place in the baking dish with the open flap side down. Combine sugar, water and butter in a small sauce pan; bring to a boil. Pour over tortillas. Let stand for one hour. Sprinkle with cinnamon and sugar. Bake at for 45 minutes in an oven preheated to 350° F.
Let stand for about 5 minutes before serving. 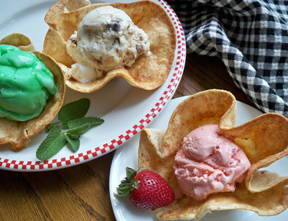 Serve on their own or with a scoop of ice cream. Note: You may not need the whole 1/4 cup of cinnamon & sugar mixture. Use to your own taste. "I made these apple enchiladas as our dessert to go with our Mexican-Style Lettuce Salad. I am glad we only had a salad because I ate two of the apple enchiladas. 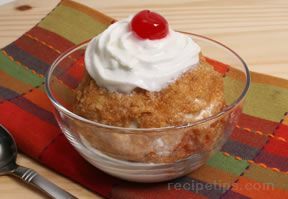 They were so good served hot with ice cream."